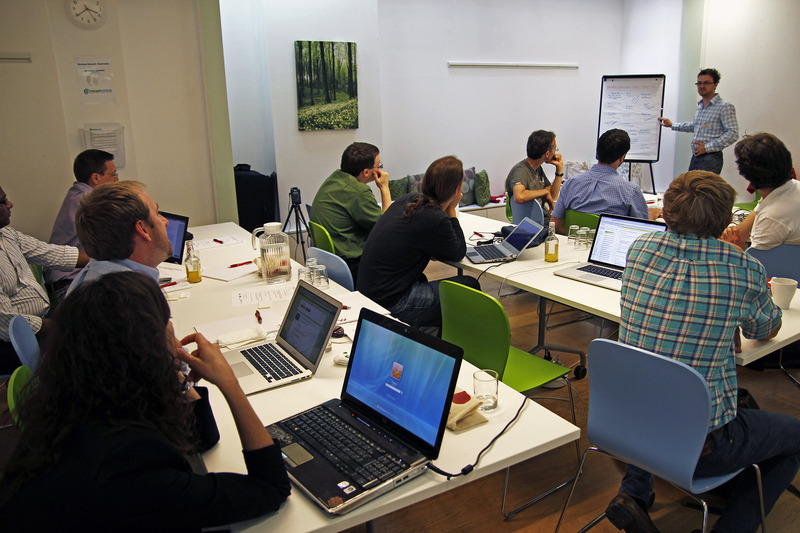 Last week, Mendeley hosted an all day workshop on Academic-Industrial Collaborations for Recommender Systems. As we’re fast running out of space in our London office, we rented a venue that was nearby named Headrooms. With a friendly staff, attentive to everyone’s needs and great start-up décor, I’d definitely rent it again. In the morning and early afternoon we were treated to seven talks from a variety of speakers who shared their experiences of academic-industrial collaborations and recommender systems. We finished the afternoon by splitting into smaller groups to discuss the challenges involved in making such collaborations a success and sharing useful advice with one another. The day then finished, as all good days do, with a quick trip to the funkily named Giant Robot, to taste some of their excellent cocktails. Seven presentations were delivered by our eight speakers, one of them being an entertaining double act. We tried to film as much of the event as we could so that we could share them with you afterwards. First off, Jagadeesh Gorla began with a presentation entitled A Bi-directional Unified Model. Jagadeesh talked about the results presented in his www2013 paper on group recommendations via Information Matching, a new probabilistic model based on ideas from the field of Information Retrieval, which learns probabilities expressing the match between arbitrary user and item features: this makes it both flexible and powerful. He is currently working on developing an online implementation for deployment in an online gaming platform. Our double act, Nikos Manouselis and Christoph Trattner then followed with the intriguingly entitled presentation Je T’aime… Moi Non Plus: Reporting on the Opportunities, Expectations and Challenges of a Real Academic-Industrial Collaboration. They gave an honest and candid reflection of their expectations for working together and how some of their past experiences in other collaborations weren’t as successful as hoped. It was great material that fed into the discussions later in the day. Heimo Gursch then gave some Thoughts on Access Control in Enterprise Recommender Systems. While his project is still in the early stages, he had quite a few experiences that he could share from working with industry partners from the perspective of an academic. He was working on designing a system that would allow employees in a company to effectively share their access control rights with one another rather than relying on a top down authority to provide them. It’s also the first time that I’ve seen a presenter give his car keys to a member of the audience. I do hope that he got them back. Maciej Dabrowski delivered an exciting presentation Towards Near Real-time Social Recommendations in an Enterprise. His team and him have been working on a cross-domain recommendation system that works in a federated manner. It exploits semantic data from linked data repositories to generate recommendations that spans multiple domains. Mark Levy, from our team here at Mendeley, then presented some of the work that he has been doing in a talk entitled Item Similarity Revisited. The presentation was filled with useful advise from an industrial perspective on what makes a good recommender system. He also explored the idea that simple algorithms may be more useful than complex ones in an industry setting, showing some impressive results to back it up. I’ll include Mark’s presentation after his paper has been published. Benjamin Habegger then took us on a rollercoaster ride exploring some of his successes and failures in his last startup, 109Lab: Feedback from a Start-up Experience in Collaboration with Academia. He reflected on his experience of co-founding a startup and what he learned from it. Although he worked with academia during the process, he wasn’t clear about the value that it actually brought. Finally, Thomas Stone presented Venture Rounds, NDAs and Toolkits – Experiences in Applying Recommender Systems to Venture Finance. Thomas had some nightmare experiences with NDAs during his PhD. So much so, that he’s still unclear what he has the right to publish in his thesis. He also gave a nice introduction to PredictionIO, an open source machine learning server. Once the presentations were given, everyone was invited think about the challenges and difficulties that they had faced in working in academic-industry collaborations and to write down some topics on a flip chart. We then split into three groups and, using these topics as guidance, discussed the issues faced and presented some solutions. Prototypes vs roduction code – do the partners know what is expected from whom? After the three groups discussed the points we all gathered back to share our thoughts and conclusions. In general, we all seemed to share similar problems in making academic industry collaborations successful. We discussed that there should always be a clear set of expectations agreed from the outset and that partners should know their roles. Communication lines should be kept open and the spirit of collaboration encouraged. What’s more, it can help to have members of the teams working together in the same physical location, even if it’s just for a brief period, in order to work together well. Working in academic-industrial collaborations is hugely rewarding but it can be tough. Finding the right partners who understand each other’s goals and constraints is important from the outset. We can all learn from one another but we need to put in some effort in order to enjoy the rewards. I’d like to thank everyone who put in the effort to make the workshop a success and, as I follow up the several e-mails that I’ve got, hope to start to new and fruitful collaborations! « What makes a Search Engine different from a Recommender System?